Note: Overcurrent protection must be provided at time of installation by a circuit breaker on the primary (shore) supply circuit. 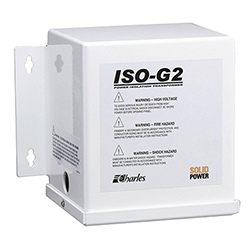 A 2-pole circuit breaker is required for the shore power line going into the IsoG2. This should be rated at 30 Amps, 120 Volts, 3000 ampere interrupting capacity (AIC) and be of the long-time delay type. Boat wiring is a complex task that can pose shock, corrosion and other hazards if not done properly by trained, experienced personnel. Note: Charles Transformers are designed to work with either 50 Hz or 60 Hz, but they will not convert hertz from 50hz to 60hz or 60hz to 50hz. Marinco EEL 30 Amp ShorePower Cordset - 25 ft.
Marinco EEL 30 Amp ShorePower Cordset - 50 ft.